Hope Overflows isn’t church as usual. 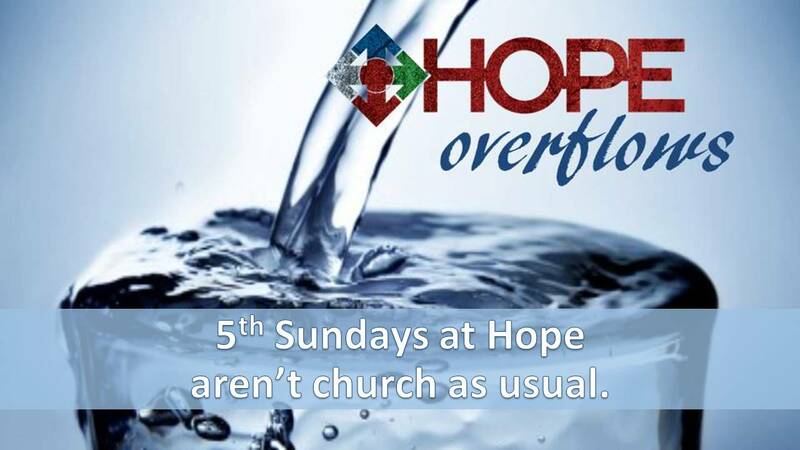 Hope Overflows is what we, as Hope Community Church, come together for on all 5th Sundays. Even if you have never been to Hope before, YOU ARE WELCOME! Don’t worry-there is always plenty of food, plenty of chairs, and plenty of opportunities to connect. We meet for breakfast as a family at 9am. Families bring a dish to share: a casserole, fruit, doughnuts and even cereal. The church provides paper products and drinks like coffee, orange juice, milk. After breakfast we have a short service where we sing a couple songs, we pray for our focus that morning, and then we are released to serve corporately, as one body, the Body of Christ so that Hope Overflows. We serve our neighbors. We serve at the food bank. We serve at nursing facilities. We serve foster families. We serve at drug and alcohol treatment centers. We serve at schools. We want the hope that lives within us to overflow out of us and into our communities. It is that simple. We don’t see this as a means of salvation and we don’t gain extra heaven points.